9 Where do the acids come from? 10 How acidic is a food? 12 Why is our metabolism not compatible with today's diet? 15 How can you detect latent over-acidification? 18 Excessive training sessions make you "acidic"
A regulated acid-base balance is a prerequisite for your health. For some people it is clear, while others do not know anything about it or it is sometimes a controversial topic. People who deal with holistic medicine are aware of the impact of the acid-base balance on our entire organism. Long-term disturbances of this natural balance are increasingly attracting attention. Rightly so based on naturopathy and the current state of scientific knowledge. This differs significantly from the view that continuous pH regulation is taken for granted. Here it is assumed that the body is always ready to meet changed conditions and the buffering capacity of the human body seems to be inexhaustible. But every system that works so well reaches its limits when overloaded. You can learn more by continuing to read about what our acid-base balance actually is and how our behaviour and especially our diet affect this. All of our metabolic processes depend on a variety of conditions. An adequate supply of nutrients and oxygen is just as relevant as the correct pH value. The right pH value – that is the optimum pH, at which the numerous enzymes in our body can optimally convert proteins, lipids and carbohydrates into energy and at which cells, muscles and organs function optimally. The complicated thing is that this optimum varies everywhere. Our stomach is extremely acidic as we all know to, for example, kill undesired bacteria, but saliva tends to be basic. The amazing thing is that the human body actually regulates this reliably by itself. Fluctuations can essentially be mopped up, but long-term changes can negatively impact transport of nutrients, enzyme activity and organ function. It is known that the gastric mucosa forms gastric acid (hydrochloric acid) to digest the food we consume and to kill pathogens. At the same time, the same quantity of bases (bicarbonate) are formed. This bicarbonate enters the bloodstream (alkaline tide) and from there goes to the pancreas and then to the small intestine. The acidic chyme is then neutralised here. The resulting alkaline tide not only supplies the digestive organs, but also supplies the connective tissue with bicarbonate. Acids found there as, for example, metabolic waste products can be buffered and transported to the kidneys where they are excreted. It is always impressive how our body continuously strives to achieve equilibrium. Our metabolism with its many fascinating biochemical processes needs optimal regional pH values, i.e. an optimal ratio between acids and bases. Our body has sophisticated regulatory mechanisms to maintain a healthy balance. A variety of organs that regulate the acid-base balance and so-called "buffering systems" that can counteract imbalance are involved. This complex regulatory system is also known as the acid-base balance. A variety of organs are involved in this system especially the lungs, kidneys, blood and our connective tissue which assume various functions during their work together and support or relieve each other. 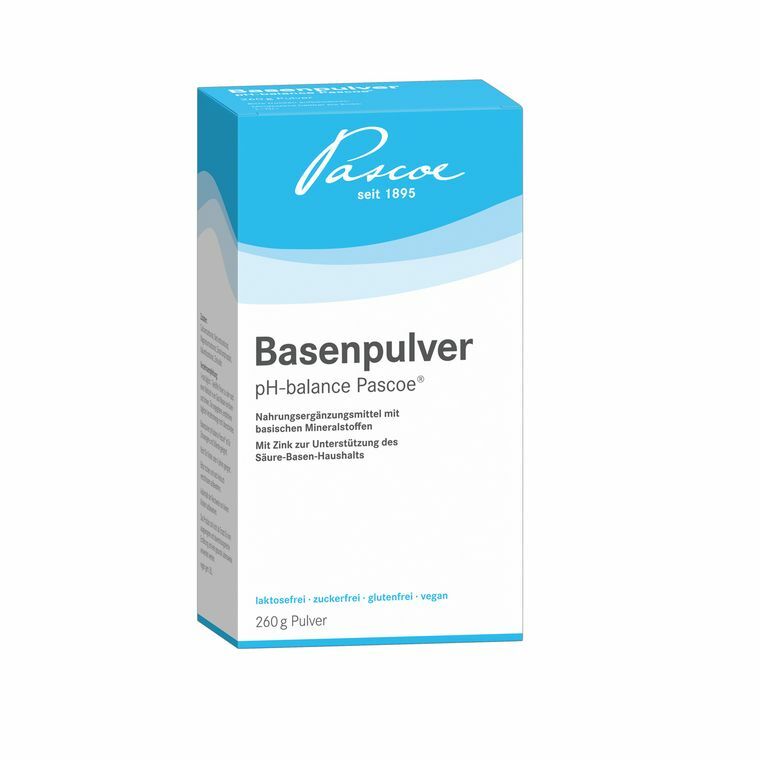 The body's own "buffer systems" are essential for maintenance of the acid-base balance. Their name describes their function very clearly: they buffer and counterbalance. Buffer systems consist of weak acids and weak bases. These are balanced chemically. If acids or bases are added to such buffer systems, the ratio of concentrations changes, but the pH value remains largely constant. And that is the most important thing as the buffer systems in our body can then counterbalance or mop up the acids that are produced, for example, during our metabolism. There are a variety of buffer systems that are available for regulation of the acid-base balance. The most important buffer system in our body is the carbon dioxide-bicarbonate buffer system in our blood. It is the most important system for two reasons: on the one hand, it ensures the crucial pH value of the blood which only allows a very small tolerance. In healthy people, it must be continuously maintained in a clearly defined range of pH 7.37 – 7.43. On the other hand it is a so-called open system as it includes an "elusive" component: carbon dioxide. It can also be exhaled quickly via the lungs, if needed. This makes the system extremely effective. All other buffer systems in the body are coupled with the carbon dioxide-bicarbonate buffer system and serve as a "backup" for the main buffer system, i.e. a safeguard in the background. Because the consistency of the acid-base balance is so important for our body, it is equipped with sophisticated and effective systems to ensure the functionality of our body and our metabolism. Where do the acids come from? The most important factors that impact our acid-base balance are our diet and maintenance of our liver function. Acids are formed primarily by the breakdown of amino acids, the building blocks of proteins. Animal-based foods such as meat, eggs and milk contain large amounts of proteins. Therefore, they are mainly classified as acidifying. Most plant-based foods such as fruit and vegetables contain very little protein, but a lot of basic minerals. Therefore, they are considered to be base-forming and have a deacidifying effect. A balanced, basic diet should consist of around one third acid-forming and two-thirds base-forming foods. How acidic is a food? Of course the taste doesn't actually provide any information whether a food is acid-forming or basic. For example, acidic lemons or red currants belong to the group of basic foods. Remer and Manz developed a reliable and scientifically worked out assessment of the probable burden that can result from metabolism of our food. They calculated what quantity of acid must be excreted by the kidneys when food is consumed. This results in the so-called PRAL value (potential renal acid load = potential acid burden for the kidneys). What role do the kidneys play in this? They are responsible for excreting acids that cannot be exhaled easily by the lungs. These occur primarily when proteins are broken down. Basic foods such as vegetables, fruit and herbs contain primarily base-forming minerals such as sodium, potassium, calcium, magnesium and iron. You can see how various foods work in your body in the Acid-base table. The values in the table (always related to 100 g) provide information on whether the foods are metabolised to an acid (yellow) or have a basic effect (blue). The PRAL values of acidic and basic foods indicate the degree of acid loading: a high negative value means that the food has a very basic effect (for example, spinach in the "vegetables" section with a PRAL value of -14); a high positive value, on the other hand, indicates that the food has a strong acidifying effect in the body (for example, Parmesan cheese with a PRAL value of 34.2). Plant-based foods packed with minerals have a low protein content and have a markedly base-forming effect. A diet rich in vegetables provides many important vitamins that are essential for our energy balance and bodily functions among other things. But also mineral water with a high content of hydrogen carbonate has a strongly base-forming, counterbalancing effect. A portion of meat (e.g. 200 g turkey) can be counterbalanced with 500 g of mixed vegetables. Why is our metabolism not compatible with today's diet? It is not that long ago that our diet underwent radical change. Consumption of industrially processed food (fast food) and dairy products has increased greatly, especially over the last two generations. However, our metabolism still functions as it did 10,000 years ago. The diet of our ancestors had a base surplus for a long time. They mainly consumed basic foods such as herbs, berries and other fruits, nuts, seeds and rarely meat. Nowadays, acidifying, animal-based foods are mainly consumed as well as easily digestible carbohydrates. Our body is not prepared for this and has not had enough time to adapt to the altered conditions. We have tended to nourish ourselves over many millions of years with a basic, meagre diet since the stone age – but we have been living in abundance as a result of the industrial revolution only since the middle of the last century. Nutritional awareness in the population has increased significantly and the call of the German Nutrition Society – to eat fruit and vegetables five times a day – has already found its way into the minds of many people. However, it is necessary to do more for the acid-base balance. A healthy, balanced, basic diet has a positive effect on the body's acid-base balance. Consumption of foods that are primarily metabolised as acids can burden the acid-base balance in the long run. The body cannot mop up the large amount of acid and the extremely effective buffer systems reach the limit of their reserves and are depleted. This condition is known as latent or chronic over-acidification (latent acidosis). Thereby, the essential pH value of the blood remains within a normal range at the expense of the buffer capacity in connective tissue. The explanation of naturopathy that this can alter the pH value in the connective tissue appears to be plausible at this point. The connective tissue is the largest "organ" in our body. It is found in all areas and organs. Changes to the pH value in connective tissue can, thus, impact our entire body, enzyme activity and organ function as optimal pH values cannot be maintained. How can you detect latent over-acidification? Chronic over-acidification usually develops unnoticed over years. Depletion of the regulatory systems is not (unfortunately) noticed due to acute symptoms. Then it would be easy to establish a direct link and the acid-base balance would play a more important role in general medicine. Unfortunately, latent over-acidification only makes it itself known through non-specific, silent, imperceptible symptoms, such as chronic fatigue and lethargy, problems with the skin, hair and nails, chronic inflammation and non-specific digestive problems. A general and helpful sign of latent over-acidification is the low pH of urine resulting from increased urinary or renal acid excretion. pH test strips can be used for this. You can find the data sheet for evaluation of the pH test strips to estimate your acid burden here. The increased acid burden caused by the diet and, thus, chronic over-acidification (latent acidosis) is one of the main factors responsible for the emergence of a variety of symptoms and the increase in diseases of modern civilisation. Epidemiological studies suggest that a long-term excessively elevated acid burden can cause risks to the health. Corresponding relationships were found in studies on bone health (osteoporosis). Merely restricting the acid-base balance to consideration of the blood pH value is no longer in keeping with the times. It completely disregards the physiological processes (= corresponding to the natural function) and pathophysiological changes (= deviation from normal functional mechanisms) in the connective tissue. Many studies demonstrate that base-rich food promotes health, can have a preventive effect and can also alleviate the symptoms of various illnesses. Quite a few studies have demonstrated that sport is generally good for body and soul. Sports activities have been proven to reduce stress hormones (such as cortisol and adrenaline). They promote at the same time the secretion of happiness hormones (endorphins) and hormones (human growth hormone and FNDC5) which are involved in important physiological processes. People who eat a healthy balanced diet, exercise regularly and who also allow time for regeneration do not need to be concerned about their acid-base balance. Or do they? Healthy nutrition and the frequency and intensity of exercise is discussed controversially among scientists and in sporting circles. Excessive training sessions make you "acidic"
During intense physical exertion, the muscles must be provided with more and more energy in a short time. However, as the tempo increases, it eventually becomes impossible for the body to transport enough oxygen to the muscles. Now the body begins to produce energy from carbohydrates without the uptake of oxygen (anaerobically). This produces lactic acid (lactate), which accumulates in the muscles during prolonged exertion. The consequences of this are: The muscles literally become "acidic". The activity of enzymes essential for the body's functions that can only work perfectly when the cells are at an optimal pH, may be impaired. Athletes often suffer from chronic stress without knowing this if they are not paying enough attention to regeneration after sport. At the physiological level, sport initially damages the body because it triggers stress and inflammation. However, what sounds negative at first, actually means the exact opposite. The body needs stress (so-called eustress) to adapt itself during the regeneration phase; only through this does it become stronger and more stress-resistant. However, if the stressors are too big and our body cannot keep up with the adjustment, we respond with negative stress (distress). Ambitious athletes find themselves very quickly in this negative spiral (overtraining), if they do not have sufficient rest periods between training sessions. People who exercise regularly or play competitive sport generally have a higher need for micronutrients, which results on the one hand from increased physical stress and on the other hand by transpiration. If athletes are also in a cycle of stress due to overtraining and/or have sports injuries that have not healed, the consumption of basic minerals such as magnesium, calcium and zinc increases. A sufficient level of these micronutrients is absolutely essential for our body. Magnesium and calcium serve as building blocks for the bones and for transmitting nervous impulses to our muscles. The vital all-rounder, zinc, is involved in many biochemical processes in our body. It protects cells from oxidative stress and supports a regulated acid-base balance among other things. Adequate consumption of micronutrients is imperative for ambitious athletes so that they remain performance-driven and resilient. A chronically acidotic body does not happen overnight. The restoration of a healthy balance can also take time. You can support the acid-base balance with the right steps. When you understand the basic principle, it is really easy. Fruit and vegetables are considered to be ideal base-forming foods. They should feature daily in your diet to prevent over-acidification. A predominantly basic diet consists of 2/3 fruit and vegetables and 1/3 animal-based acid-forming foods. Drink sufficient water or green tea to flush out your kidneys thoroughly so that they function reliably. For breakfast: Almond milk with blueberries and apples, quinoa, nuts and sunflower seeds. Midday: A large plate of salad with a few strips of poultry or Asian stir-fried vegetables with fish and rice. Evening: Delicious vegetable soup or stir-fried broccoli with almonds and green spelt cutlets. If you get hungry between meals: Fruit or vegetable sticks. The liver also plays an important role in the acid-base balance. It is also responsible for an optimal blood pH value. Supporting the liver with bitter substances contained in vegetables (artichokes, chicory, radicchio), herbs (milk thistle, dandelion, gentian, hops and wormwood) and fruit (grapefruit) also benefits the acid-base Balance. The minerals zinc, calcium and magnesium are vital nutrients for our body. First and foremost zinc is vital for the production of buffer substances that are necessary for correction of the acid-base balance. It is also an important component of skin, nails and bones and boosts the immune system. Calcium gives the bones support and structure. Magnesium supports the nervous system and muscle tissue. Minerals are mainly found in plant-based foods. Green tea is also a valuable source of minerals. Together with its stimulating effect on the metabolism, it can provide support if you have set weight reduction as a goal, for example. In addition, special mineral preparations can help to cover increased demand in specific stress situations. The entire body benefits from moderate sport. Some exercise in the fresh air already has a positive effect as exercise activates and supports energy metabolism and excretion. Regular activity in conjunction with sufficient time to relax can also help you to reduce stress. Breathe consciously! Elusive acids (carbon dioxide) can be exhaled by the lungs. Intensive breathing with the diaphragm, plenty of fresh air and regular endurance training with conscious breathing promote correction of the acid-base Balance. Sweat! Whether during sport or in the sauna. Acids can also be excreted via the skin. Apart from this, going to the sauna and engaging in physical exercise promote the metabolism, liver and kidney function and, thus, excretion. Exercise supports the removal of metabolic products from tissue. Moderate sport can contribute to deacidification.